Democratic Representative Ilhan Omar was at the center of a smear campaign on Tuesday after her criticism of Israel and the biggest pro-Israel lobby in the U.S., AIPAC. Drawing fire from fellow party members, President Donald Trump and many other lawmakers, Omar was accused of "being anti-Semitic" even though she did not utter a single word invoking racism against Jewish people. Nevertheless, in the U.S., where the Israeli lobby is so strong that one can be accused of anti-Semitism for a single word Israeli government deems offensive, it was not long until Omar faced heavy insults and slander. In a pair of tweets over the weekend, Omar criticized the American Israel Public Affairs Committee, or AIPAC. "It's all about the Benjamins baby," she wrote, using slang about $100 bills. 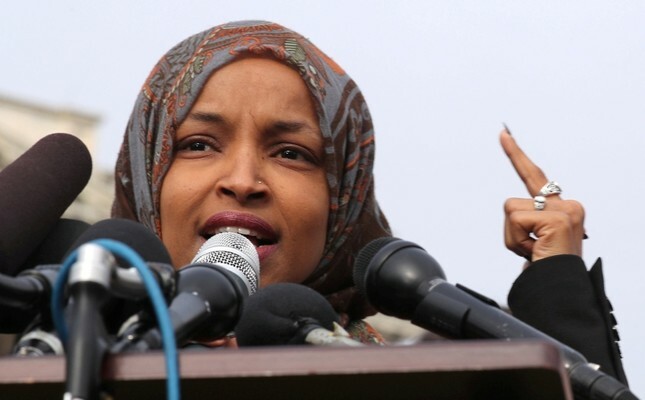 As if no people other than the Jews use money for daily affairs, which ironically is anti-Semitic in itself, one lawmaker claimed that Omar used the anti-Semitic trope of "Jewish money." Later asked on Twitter who she thought was paying members of Congress to support Israel, Omar responded, "AIPAC!" This response also very much reflects the truth, and carries no sentiment close to anti-Semitism as it is widely known that in addition to Jewish members of the lobby, many other members of AIPAC are non-Jewish people in favor with good relations with Israel. AIPAC is in fact so strong that it is considered the most powerful lobby after the gun lobby in the United States. Former president George H.W. Bush once said "I'm just a little, alone man opposing thousands of lobbyists in Capitol Hill" regarding a disagreement with AIPAC on mortgage loan guarantees to be given to Israel. The New York Times also reminded in a story that Ronald Reagan and George H.W. Bush also had some minor issues with AIPAC but never dared to oppose the lobby. Omar's statement was the latest reckoning among Democrats of intense differences in their ranks over the U.S.-Israeli relationship, highlighted by criticism from Omar and Rep. Rashida Tlaib of Michigan. They are the first Muslim women to serve in the Congress. Pelosi and other Democrats, including leaders and chairmen, laid down a marker making clear that Omar had overstepped. Omar supports a movement known as BDS, for "boycott, divestment and sanctions" aimed at Israel. And it's not the first time she's fought accusations of anti-Semitism. She has countless times reiterated that her rejection of the Israeli government refers to its stance toward Palestinians and is not directed at Jewish people. Omar has also expressed regret for tweeting in 2012: "Israel has hypnotized the world, may Allah awaken the people and help them see the evil doings of Israel." She said the statement came in the context of Israel's treatment of Palestinians in the Gaza Strip. People defending her left yellow notes of support on Omar's office nameplate on Capitol Hill. One of those notes was one that read, "Mazel Tov."